A huge assortmant of festive items to paint! Great for decorating your home for Christmas. 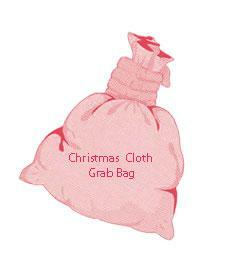 Every Grab Bag contains a festive coffee-cloth plus at least 5 other decorative items such as a Santa Sack, a Festive Hand Towel, Door Santa, Christmas Tree Wall-hanging on velvet, assorted gift tags, tree-decorations, festive samplers and festive bookmarks to give as a gift with your Christmas cards. Total value over $150 worth, some up to $160 worth of items to paint in every Grab Bag! MEGA VALUE!